This Waltons 12ft x 10ft Reverse Apex Wooden Workshop is a quality garden building that provides space for a work bench, shelving and storing away gardening equipment. 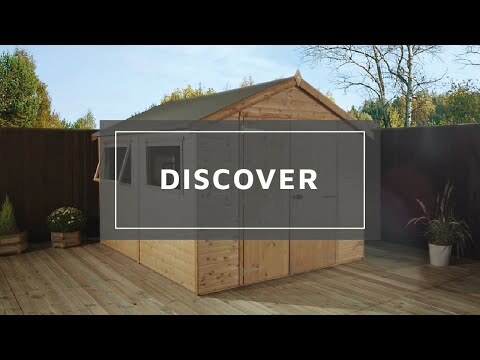 Featuring a traditional design, this timber workshop will look great in any garden and will last for many years. The timber used to construct this garden workshop has been ethically sourced and is clad using 12mm tongue and groove cladding for a strong, durable build. Tongue and groove cladding features an interlocking design for a robust build that prevents water ingress. Thick 2" x 1" interior framing is used to provide additional strength to this structure. A single, opening window is glazed with shatterproof styrene, a safer alternative to traditional glass that is ideal for buyers with young families. Double doors provide easy access to the interior; a rim lock is supplied as standard for added security. The apex roof prevents the build-up of rain water, protecting against weather damage. Heavy duty mineral roof felt is supplied to offer further protection against wood rot. Complete with a ten year anti rot guarantee, you can be confident that this wooden workshop is a great investment. Our Reply:Good morningThank you for taking the time to leave your feedback today. We take all feedback very seriously and it good to know that you are happy with your recent purchase. I am pleased that you are happy with the value for money of your shed. Customers do not have to help unload, it is the duty of our delivery staff to do this and this will be looked into. Thank you for your feedback!